Dr Haramohan Mishra with a brilliant academic record of securing the best graduate and the first class first position in B.A Hons. 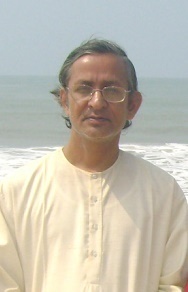 and M.A in Sanskrit of Utkal University, got Ph.D for his study in the field of Advaita epistemology. He has been teaching in various government colleges of Orissa and is engaged in intensive research in Advaita Vedanta and Tantra. He has written many papers and books on these fields of Indology.